The Flashback Replica series reprints significant golden age comic books. Each issue is an exact reproduction from the original and includes all editorial and ad pages. 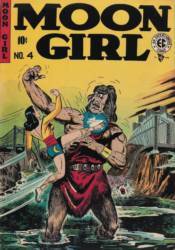 Moon Girl #4 continues the early superhero series from Shelly Moldoff and EC Comics.